A binary clock is hardly a new idea, but this particular concept is something I haven’t seen anywhere else. And it was idling in the back of my mind for over a decade before finally seeing a working prototype. The passage of time can be measured in any number of ways, but when a clock is designed for humans, I think it should be based on a natural concept. Since I live on Earth, I designed a clock, as many others have, based on the smallest natural temporal concept I can readily observe: the day. The day is plenty useful for medium-term planning, but it lacks the precision needed for many purposes, and so it must be divided in order to build a useful clock. This is where clock design becomes much more arbitrary. Dividing the day into 24 was supposedly based on astronomical observations of various stars passing in the night, but beyond that, there’s no natural reason there should be 60 minutes in an hour and so on. My thought, is that the simplest and most natural way to divide a day would be in half. This is essentially the AM/PM indicator which is a concept so natural and necessary, that even many of our 12 hour clocks use it to avoid the otherwise ambiguous information displayed. But if the most natural way to divide a day is in two, then maybe the next most natural division is in two again. Dividing a day repeatedly in two results in a kind of binary clock. And this is exactly the concept. Let’s explore the design I’ve had in mind. This idea has taken many shapes in my head over the years, but the picture I’ve had in mind most often is a series of LEDs, each representing a successive division of one full day. For a practical, human-oriented clock, we’ll need enough precision to be useful for normal human activity. One single LED cuts the day in half, providing half-day precision, but that’s far too granular to be able to plan intra-day activities. Adding two more LEDs takes the precision down to 1/8th, and with four you get 1/16th of a day. For any number of LEDs, the precision of this clock is 1 / (2 ^ n). In order to approach one second precision, we would need 16 individual LEDs. And even that final light would represent a period of time slightly longer than a second. But down-to-the-second precision isn’t often required in day to day human activity. Since I want to learn to read my own clock, I decided to try to keep the display as simple as possible, and that means using as few lights as I can get away with. Eight LEDs give me a good balance. I don’t usually need more precision than I can get out of eight bits and keeping the LED count down to eight should make the clock easier to read. Here are a few examples of how this clock display could be translated into conventional 12/24 hour format. The first few digits are very easy to learn to read, but they get more difficult if you plan on translating them to the convetional format in your head. One of the things I’m most curious about, is how hard it will be to learn to understand the meaning of this clock without having to do the conversion. The information in the clock gets progressively more granular as you read from left to right. It may be that the first 4 LEDs can give you all the precision you need, but as with a conventional digital clock, you can decide where to stop reading when you’ve gathered enough information. The recent explosion in the number of low-cost WiFi enabled development platforms was the driving force behind why I finally started on this project. Previous systems were either too bulky, power hungry and expensive, or would have required a lot more effort on my part. In order to avoid implementing a system for manually setting the current time on this clock, I wanted a platform that included easy internet connectivity so the clock could set itself using NTP. For me, WiFi was part of this requirement along with all the nice network interface features we’ve come to know and love like DHCP support and a working TCP stack and preferably HTTPS support in case I want to get really fancy. Of course, a real-time clock (RTC) is important when building a clock and it’s nice to have one built-in. It’s always possible to add your own, but my hardware experience is limited and a microcontroller that includes an RTC allows me to skip that hurdle. I also wanted enough I/O pins with enough power to drive 8 LEDs so as to not require fancy multiplexing or extra circuitry. Other concerns are power consumption, cost, and how easy the platform will be for a software person like me to learn. 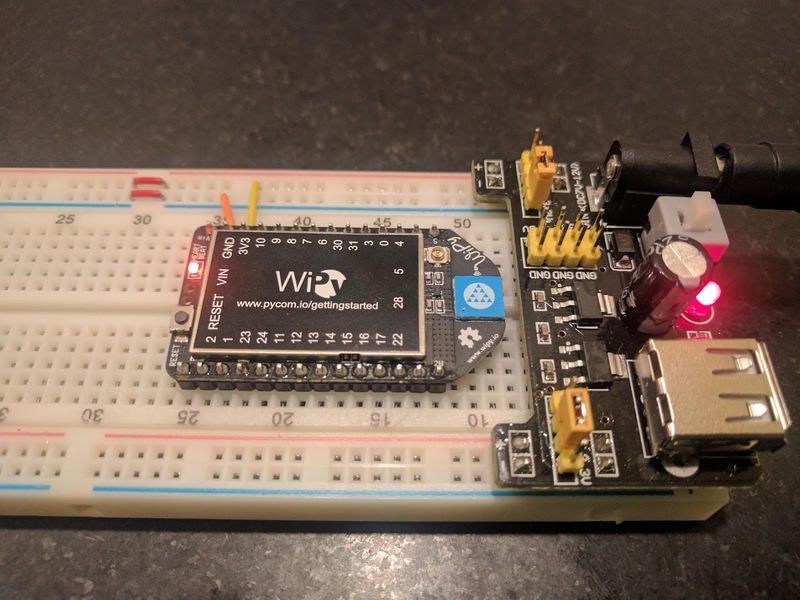 In the past, for WiFi connected projects, I’ve used arduino and a repurposed wireless home router because those were the best options available at the time. But today, there are all kinds of other interesting options. WiPy is the one I ended up on for no particular reason other than I found it early on in my search and it ticks all my requirement boxes. One other interesting thing about the WiPy is that you can write software for it using tiny version of Python called MicroPython. For me, this is an advantage over alternatives like Wiring/Processing which I’ve battled before. Python is a more comfortable environment. True to my open source roots, I created a GitHub project to house and track the evolution of the software that drives Byte Clock. I likely won’t do a whole post on how the software works because it will likely evolve and anyone with sufficient interest can keep an eye on the GitHub project for updates. It’s enough to say that the software is responsible for synchronizing the real time clock with an NTP server and managing the state of the clock’s display. In addition to the WiPy microcontroller, I bought a cheap 3.3v power supply from Amazon and a bread board. The power supply takes 6.5-12v DC input and provides 3.3v or 5v DC output. In this photo, I’ve got the power supply and the WiPy connected on the bread board. Here’s what it looks like powered on for the first time. Getting up and running with the WiPy was pretty simple once I figured it out. When the WiPy powers on for the first time, it creates its own wireless network which anyone can join and from there you can upload your own code over FTP. 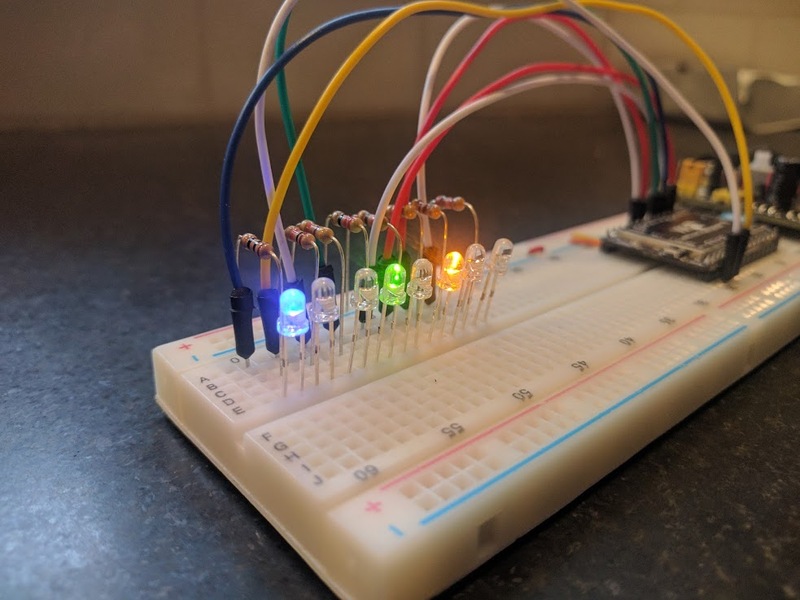 Adafruit has a handy guide with more detail on how to get started. 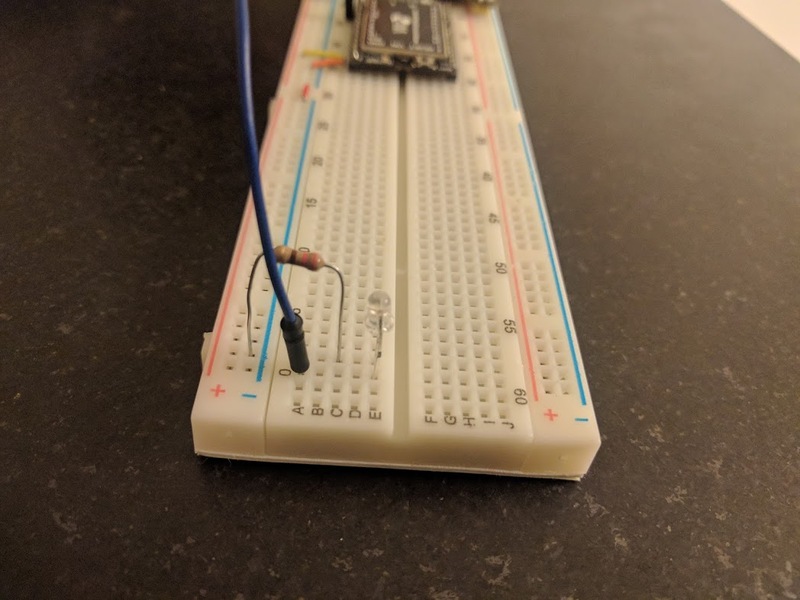 Here’s a very exciting video of the moment when I made it past the first hurdle, blinking an LED. The clock display amounts to a binary counter, so that was a natural next step. I chose eight different colored LEDs and hooked them up to the first eight I/O pins on the WiPy. The various colors have differing forward voltage Vf values and different brightness properties. In order to roughly match the brightness levels, I had to choose different current limiting resistor values for each one. Attempting to match the current of each LED methematically resulted in wildly differing brightness levels, so choosing the right resistor values ended up being a lot of trial and error. The display test program didn’t take long to write. Here it is in action. With the LEDs connected to the WiPy and the WiPy connected to the internet, the rest is software. It would have been awesome to build a Byte Clock without having to use a conventional clock to drive it, but that was the simplest available option. If you examine the source code, you’ll see the time keeping is done using the MicroPython RTC class. The system boots, grabs the current time from an NTP server, sets the real-time clock and sets a timer to increment the display state every interval. I’ve had this clock running on my kitchen counter for a few months and it’s still keeping accurate time aside from missing the time change. I’ll need to implement that function. Thinking about this clock has made me ask all kinds of questions about the nature of conventional clocks and how we go about our days. For instance, why should clocks start at midnight? And what exactly is midnight by the way? Would it make sense for clocks to start counting at sunrise or noon instead? It might, and I haven’t ruled out playing with that idea. But going down that road makes conversion to convetional 24 hour time a lot more difficult. Why should clocks count up and not down? We could just as easily design a clock that counts down the time remaining in each day. Would that be good? Communicating information about moments in time with the byte clock is presents a challenge. Reading all eight digits aloud would be inconvenient (“on off on on on off off on”). But since this is a Byte Clock, the time could be expressed with just two hexadecimal digits (b9). That’s a pretty concise way to express the time of day at this level of precision. After pondering the differences between the Byte Clock and conventional clocks, it seems more clear that the values 24 and 60 are not at all arbitrary. Conventional clocks are easily divided in half, thirds, fourths, sixths and eigths. The Byte Clock is, of course, only divided easily by powers of two. I think I knew this all along, but having built this clock makes me appreciate this aspect of conventional clocks. Next, I’m planning to play with the arrangement of the LEDs with the goal of making the clock easier to read. And after that, I’d like to design a slick looking case and build something that looks a bit more professional. A recent client of mine needed an app to help him build bite-sized CSV files from a large PostgreSQL table. The problem was simple enough and it takes little time to write a simple Rails action to query a table, generate CSV from the objects in memory and flush it out to the client. Writing an app to do this one thing using a traditional Rails action is a matter of just a few hours. But our client wanted to run queries that could potentially return 10, 20 or even 100 thousand records. When dealing with large numbers of records, performance can suffer because the application has to spend a lot of CPU time taking all those in-memory records and transforming them into a bunch of in-memory strings for the CSV file. Doing this in the application and entirely before sending the response means the app consumes a lot of memory and a lot of CPU time. Eventually, these responses would come through, but when you start talking about 30+ second response times, you can run into trouble from both users who don’t want to wait so long for responses and application environments where resource use and extended response times are unacceptable or maybe even disallowed. Since I was querying a pretty large Postgres table (200M+ rows) with a fairly involved query type (geographic proximity), I spent a lot of time debugging the query before realizing the problem was really in my own app. After I realized what was going on, I set about looking for a better way to build the CSV and send it to the waiting client. I found two things. First, I found that Postgres can directly generate CSV from any query and stream it back on the socket. And second, I found that Rails can stream the response coming from Postgres, directly to the end-user waiting on the other end of the HTTP connection using ActionController::Live. To tell Rails you want to stream responses from this controller, include ActionController::Live at the top. Basically, this tells Rails you want to use chunked encoding for your HTTP responses. And in your action, your response object now has a special stream property which is an IO-like object representing the outward-facing HTTP response. Anything you write to the stream is sent immediately to the user agent. That’s why it’s important to set any headers you need to set before writing any of the response body. In this case, I’m using the Content-Disposition header so browsers know to treat the response as a file download. I am using a bit of a hack to grab hold of the raw Postgres connection underlying the ActiveRecord connection because I don’t know a better way. copy_data is a method the Postgres gem provides which invokes an SQL COPY command. It typically would copy query results to a file, but since I’ve specified “TO STDOUT” I’ll be able to read the response right here from the Postgres connection using get_copy_data. As a bonus, I can ask for the results in CSV format and not have to worry about converting it myself. Now that Postgres is generating CSV for me, all my action needs to do is read the lines from the Postgres socket and write then to the HTTP response stream. The results shocked me. Queries for even large amounts of data were imperceptibly fast. The download starts so quickly its not even worth measuring and the data transfer bottleneck is certainly my own middle-tier cable Internet connection. The short version of the story is that I tried all kinds of ideas, but failed to notice the actual improvements due to an issue with the special purpose test rig I created specifically for measuring these improvements. Once I found and fixed the test rig issue, it was clear that my efforts had paid off. Unfortunately, it was not clear which ones had the biggest impact because I had hoped this final post would be an evidence-based exploration into where the performance issues lived. My best guess as to why we’re seeing this improvement is twofold. First, the number of mongo queries required to insert an error are down to a minimum of five rather than a minimum of nine. Secondly, inserting an error no longer requires instantiating a Mongoid document for every line in the backtrace. In fact, the model representing a backtrace line no longer exists at all. There could be other explanations, but I’m satisfied with the results as they are. Although I’d like to know where the improvements came from, I’m not inclined to spend the time to figure it out at this point. This is exactly the kind of result I was looking for. What began as seemingly linear performance degradation now looks a lot more like constant time. It isn’t actually that good, but the performance degradation between zero and 100k records is barely perceptible. I’m convinced the meat of this improvement came from switching to mongo’s built-in full-text search mechanism. It makes sense that using mongo’s full-text search implementation would be much more performant than doing a multi-index string search. Hopefully our users will notice and appreciate these performance gains. Keep in mind, the results shown above ran with a single thread and a single process. Depending on your hardware, you should get better throughput in a real deployment by running multiple processes and hopefully multiple threads in the future.